DS Artistic PRO Ionic 7000 Dryer with Bonus Travel Case Professional Ionic, Extreme Power Hair Dryer. 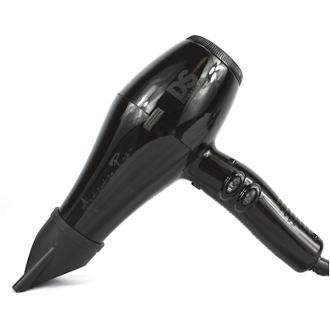 Ceramic, Ionic and Infrared Technology eliminates static and frizz while speed drying hair with 1900 Watts of extreme power. Lightweight and ergonomic . Advanced technology keeps the dryer more quiet and allows for conversation with client. For limited time, Dryer purchase Includes DS molded neoprene travel case (an added $45.00 Retail Value) . Features press & hold cold shot button to set your styles. Speed Dry Technology - Reduces dry time by up to 60 %. Workhorse Professional long lasting AC motor. Ionic Technology dries hair from inside out, eliminating frizz and promoting impeccable shine. Extreme Power, 2 Speed, 3 Heat Settings. With Cold Shot Button. For Professional Use. Professional Length 9' Cord.